Although solar power systems are generally reliable, small issues do crop up at times. The problems may be a slow and unexpected decline in power output and you may not be able to locate the actual problem. You may feel that the batteries are not generating enough power despite good sunshine. In order to investigate the problem, you will require a multimeter. If you do not know to use one, you may have to seek the help of an expert. Since you are dealing with electricity, it is always better to call a professional if you are not sure of what you have to do. Poor connection due to corrosion is the most common problem that is generally encountered. The problem could also be because of a defective blocking diode. When the panel is not generating electricity, a blocking diode prevents a backward flow of current from your batteries and protects them from getting drained. The blocking diode works like a cut-off valve. One blocking diode has to be installed for each solar panel. If the diode is defective, there can be a lot of problems, especially during low-light times like morning, evening, or a cloudy day. After checking for any obvious problems, you can start checking the panels. The panels have to be disconnected from the system before you start panel inspection. This can be done either by removing the battery terminals or by operating the isolation switch to your batteries. Test the output of each panel. If the panels are not driving power at the anticipated rate in full sunshine, it means that the connections are bad due to corrosion or some cells are defective or the diode is faulty. To identify problems due to corrosion, visually check connections. A problematic cell can be identified by checking whether the cells are hotter than the ones near them. If there is no corrosion problem or cell problem identified, go ahead and test the blocking diode. Actually, the blocking diode has to be installed with the silver ring facing the opposite side of the panel toward the output connection. Some diodes come with an arrow mark, indicating the direction of current flow. Ensure that the diode is installed properly. When you use the multimeter to check the diode, the black lead is to be connected into the socket marked COM, abbreviation for common. Set the multimeter to read OHMS. Keep the COM probe on the end away from the ring-end of the diode and the other probe at the ring-end. The multimeter must show a zero or a low reading. If the multimeter reading is high, it indicates a diode problem. Verify the result by doing another test. You can now reverse the probes. After attaching the COM probe on the ring-side of the diode, check the multimeter reading. If it does not exhibit a high-resistance reading, then the diode is faulty. You can replace the diode to solve the problem. It is always better to correctly install only one blocking diode. If you connect many small diodes in parallel to cut costs, you may get into problems. This is because diodes are never equally matched and hence the weakest one will take the entire load and fail. Then the next one will take the entire load and the problem will repeat. You can prevent small problems from becoming big ones by doing periodic checks on the system. 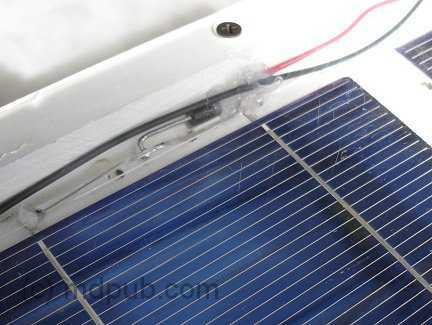 A Do It Yourself (DIY) solar panel provides a cost-effective way to produce electricity. While installing the panels, diligently follow the instruction guide and keep the system in good shape.